"California – Santa Cruz Mission - 1792"
Santa Cruz Mission was founded in the same year as Mission "La Soledad"-1791. 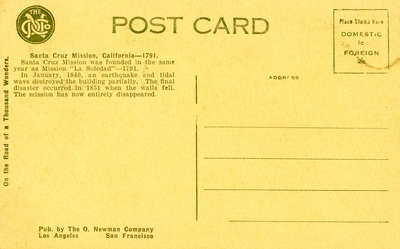 In January, 1840, an earthquake and tidal wave destroyed the building partially. The final disaster occurred in 1851 when the walls fell. The mission has now entirely disappeared.